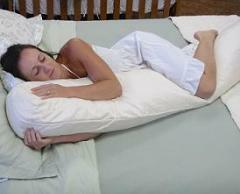 Every mama-to-be should have one of these! Organic cotton outer surrounds the light and silky fluff that is Natural Kapok. Harvested in the rainforest, kapok is a fiber extracted from the seedpod of the kapok tree, which provides the touch and comfort of down. Kapok pillows are lighter than cotton, soft, and yet supportive. Cylinder shaped 9" x 60"